Mother's Day is fast-approaching! We've got some great gift ideas and new dining options for you to celebrate with the special mom(s) in your life. We take you to a third generation family bakery run by a husband and wife. For inspiration, we meet a couple juggling six kids and six restaurants! Plus, as Jamie Apody welcomes baby No. 3, she checks out a place that's perfect for the whole family. Alicia checks out two new Center City dining options, both of which got a thumbs up from Philly Mag food critic Jason Sheehan. Alicia Vitarelli visits two new center city restaurants bringing something fresh to the city. Res Ipsa is an all-day café with Sicilian style dishes while Veda serves up modern Indian bistro fares. Melissa Magee gets the info on the first All Star Craft Beer and wine festival at Citizen's Bank Park. It's a whole new experience at the ballpark. Melissa Magee previews the inaugural All Star Craft Beer & Wine Festival at Citizens Bank Park coming up on May 20th. Saturday May 20, 2017, 3-7 p.m. So how about some flowers for Mother's Day. You can buy a bouquet or for a personal touch, create your own. 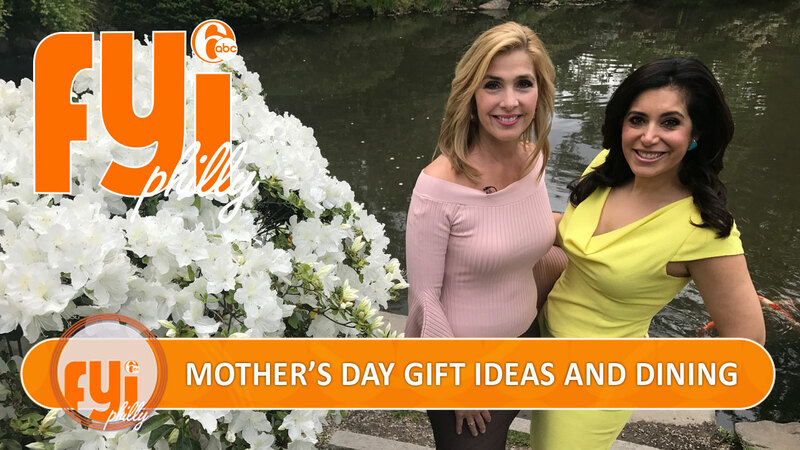 With Mother's Day fast-approaching, we visit a Mount Airy florist for a look at some beautiful bouquets and some DIY tips for creating our own! Here is your chance to win tickets to Dirty Dancing live in Philadelphia. A Philly company wants to collect your heartfelt thoughts and use them to spread joy to someone special. You can't keep the lid on love. Little Love Jar is a company that helps collect special notes into a jar and then delivers that jar to a special someone. Heartfelt words that make great gifts for any occasion! In Pottstown there's a Salt Cave where you can escape from a hectic day and into an ancient place of healing and relaxation. Spa treatments are always a solid choice but for something a little different, we headed to Pottstown -- home to a Himalayan Salt Cave where you can escape from a hectic day and into an ancient place of healing and relaxation. A South Jersey bakery stays true to the scratch made recipes that have been in the family for decades. Karen Rogers takes us to a South Jersey bakery now being run by the third generation and staying true to the scratch-made recipes that have been in the family for decades. A South Philly couple, who just welcomed babies five and six, are getting set to open restaurant No. 6.
and are getting set to open restaurant No. 6! Jamie Apody found a perfect place for the whole family to have fun, a new trampoline park opened by former Eagles wide receiver Jason Avant. As Jamie Apody prepared to welcome her third child, she found a perfect place for the family to have fun. A new trampoline park opened by former Eagles wide receiver Jason Avant! We visit a farm by the sea that's fast becoming a favorite spot in West Cape May. Beach Plum Farm is a destination down the shore but not necessarily for the beach. Melissa Magee heads to West Cape May in search of true farm-to-table experience. Spring Dinners on Friday nights. Spring Festival at the Farm on Saturdays. The Chamber Orchestra is closing its season with a very special concert, with music inspired by paintings at the Philadelphia Museum of Art. Preview Party: May 11, 4-9 p.m. In this week's Shelter Me segment, Matt O'Donnell meets some of the PSPCA's lovable pets seeking a forever home.